There is a story behind this layout! Like I've mentioned before, when we go on road trips I like to take stitching projects with me - I don't get carsick unless it's super curvy and windy roads, so it's a great way to pass the time between points A and B! Last July I taught a class in The Netherlands which involved a 14 hour drive there and back so I brought along this floral design to stitch. Once I finished, I just wasn't in love with it! I can't explain. So I tried to fall in love with it and used colored pencils to lightly fill in the flowers. Still, nothing. No love. At that point I put it in my big box of "flea market" items to bring to classes and tried to sell it. I think I brought it to 6 or 7 classes and no one purchased it. That's okay, I was probably asking too much haha! I decided to give the layout one more chance instead of tossing it. I used acrylic paint inside the flowers and instantly the layout looked 1000% better. The colors really popped! At the same time I was working on a separate project involving printing and die cutting lots and lots of flowers. 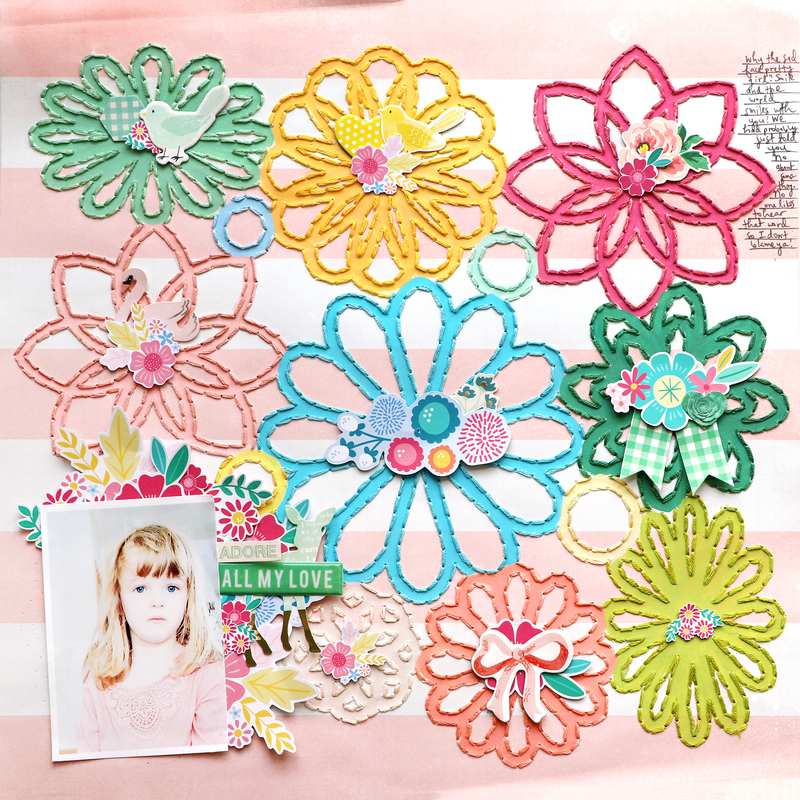 I put a few die cut flowers on the stitched flower centers and the rest of the layout came together really quickly. Almost a whole year later! Moral of the story: don't give up on layouts! Sometimes they may take days or even months, or in this case an entire year to finish, but in the end, it's worth it and memories are being preserved and recorded! Now I'm glad no one bought this stitched background :) I'm happy with the way it turned out!! I am glad you persisted!!!!! This is GORGEOUS! LOVING those flowers!!! The coloring really makes it pop!!!!!!!!!!!!!!!!!!!!!!!! !